NEW 1" SCALE RELEASE: Lester Friend's 1" scale Southern Pacific 4-4-2 "Atlantic". Drawings and critical castings now available. Click HERE. NEW! Lester Friend's "Atlantic" and "Boston and Albany Tanker" Construction Booklets from the 1940s, as well as "New Old Stock" Friends Models 1972 catalogs, are now available in "Books and Catalogs"
Updated: Find out what the prior Friends Models owner endured in the 1970s, and why Friends ceased advertising in 1979, in "Our History, 1972-1980". New! Learn a little about me; learn about what happened after Friends Models closed in 1979; and see why and how I reopened it..... in "Our History: The Lost Years,1980-2007"
New! Find out how the 3/4" scale "President Washington" patterns became a part of the Friends Models product line! Take a trip from Woodstock, Ontario Canada to Malden, Massachusetts USA, when Miniature Power Products sold the P7 design to Friends Models. Photos included. New! Read about what it took to reopen Friends Models, and, to add the designs of H.J. Coventry to the product line, in Richard Symmes' testimonial. See a grateful acknowledgment of Friends' efforts, in George Waldron's testimonial. And see what my future plans are, in "Our History, Today and Beyond". Yankee Shop "Boston & Maine" 4-4-2 Atlantic. Coming 2019! Yankee Shop "Boston & Albany" 4-6-6T. Coming 2019! Baltimore & Ohio RR 4-6-2 "President Washington"
1" scale Baltimore & Ohio "Ten Wheeler"
1" scale Southern Pacific "Atlantic" 4-4-2. Summer, 1991: I snapped this photo of Mr. Charles A. 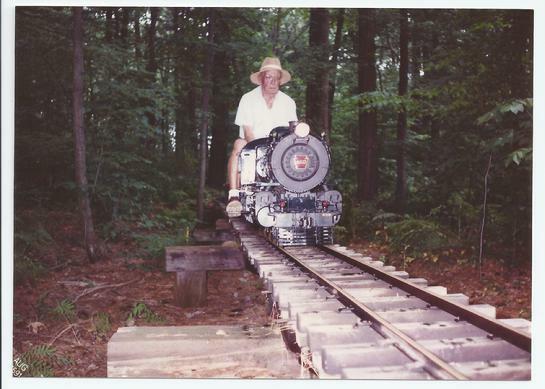 "Carl" Purinton running a 7-1/4" gauge Pennsylvania E-6 "Atlantic" at a private track in Danvers, Massachusetts. I was about 19 years of age, and Mr. Purinton was about 93 years of age, at the time of the photo. Mr. Charles Purinton runs an 1-1/2" scale 4-4-2 at Danvers, Mass. in 1991. Photo by John Kurdzionak. Back in 1932, on a suggestion from "LBSC" in Britain, Mr. Purinton founded the "Brotherhood of Live Steamers". He died in 1999 at age 101. The scene captured in the above photo is rare. Mr. Purinton did not run locomotives in 1-1/2" scale often, he most often ran 3/4" scale on a "highline". Nor did he wear his "wide brimmed" hat often. And, the date of 1991 is significant: by the 1990s, seeing Mr. Purinton run ANYTHING was a special treat not witnessed too often. The private railroad in the above photo was abandoned some 20 years ago due to the health of the owner, and then removed entirely. The property was sold, the owner passed away, and today, nature is quickly reclaiming this very location. There are no more steamers running through here. Enjoy this photo, folks, as there are not many like it. Thank you for looking. It's June of 1987, and all is well. 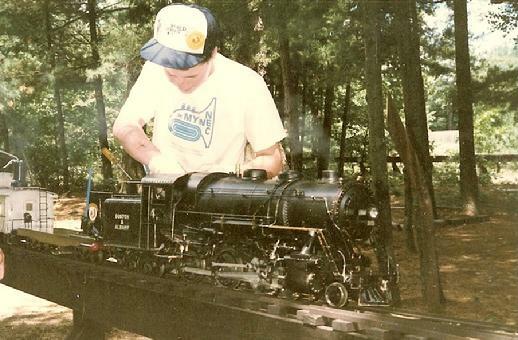 I have just finished the 10th grade, and am tending to my 3/4" scale "Friends Models" 4-6-6 Tanker at the Bass River Railroad in Litchfield, NH. It was my love for this locomotive that began everything you see on this website today. Thanks for visiting www.friendsmodels.com.